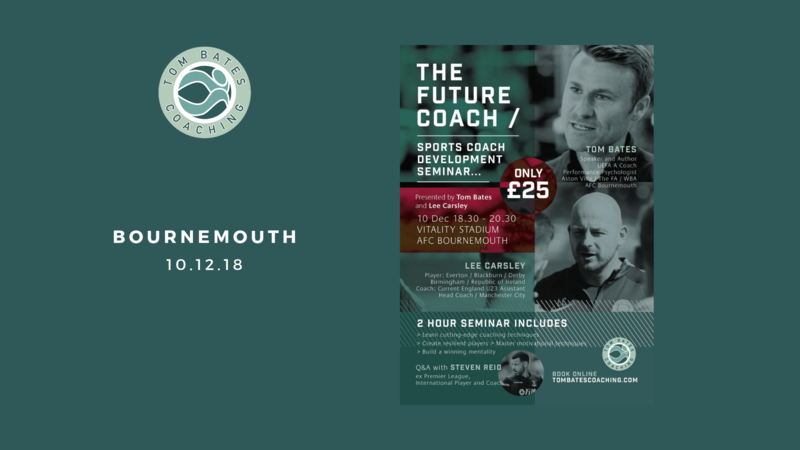 Become a better coach in 2 hours – Limited tickets available for The Future Coach Sports Coach Development Seminar at Bournemouth FC on Monday 10 December 2018. Tom, Lee Carsley and Steven Reid will be presenting, then all three will host a Q and A session. Together again! Over 10 years ago – Joe Roach, Head of Youth at Premier League AFC Bournemouth was the first to embrace Psychology in Sport. Joe recruited Tom to work with players like Sam Vokes and Josh McQuoid and assist them with their transition into first team football. Joe was and still is ahead of the game. Following a background in the British Miltary, Joe trained and qualified over 25 years ago as a professional football coach and had served the club ever since. The Team at Tom Bates Coaching are proud to support Joe once again in his efforts to create the next generation of first team players in the Premier League era. Tom found this and captured the image at the Vitality Stadium. Tom says: “It is a powerful reminder that the star of the team is the team. We are only as strong as the connection we share together. Absolutely delighted to return to the club where I started my coaching career over 10 years ago. Back then we were a League Two team fighting for survival. Fast forward to present day under the direction of my former Centre of Excellence manager Eddie Howe.